Three organizations have received rural Promise Neighborhood grants and begun the challenging work of ensuring that all children in their districts have the comprehensive cradle-to-career supports they need to succeed in school and in life. The highly competitive Promise Neighborhood grants are awarded to colleges, universities, or non-profits that serve as lead agencies in partnership with school districts and other community-based organizations in distressed communities. Berea College, the first recipient of a rural Promise Neighborhood grant, is finishing its second year of implementation with three counties in eastern Kentucky. Delta Health Alliance is wrapping up its first year of implementation in Indianola, Mississippi, and Renewal Unlimited, Inc. is completing its planning work and applying for implementation funding in Adams County, Wisconsin. Berea Promise Neighborhood has expanded its college and career readiness programs and built on its family engagement experience as the basis for expanded academic work with schools. It has formalized partnerships, set up its data system, built out its work into elementary schools and implemented early childhood partnerships, and piloted a variety of programs, in health, wellness, safety, and arts and culture. Click graphic for a larger image of this chart. 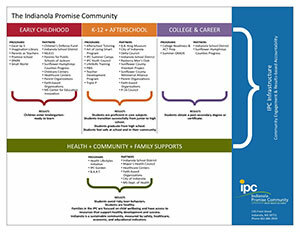 DHA Promise Community expanded pre-birth through five supports and led efforts to have Indianola certified as an Excel by 5 community—meaning it has achieved standards and provides supports to reach the goal that all children are ready to learn in school at age five. It also formalized partnerships (you can see a chart of initiatives and partnerships here) and began working directly with the Indianola school district and other partners to establish and expand after school programs. It devoted significant effort toward the infrastructure to collect and manage academic data in a way that also directly supports student learning. In addition, DHA worked with the district to create extended learning periods in every school. Lisa Curless is Project Director at Adams County Promise Neighborhood. Renewal Unlimited, Inc. brings extensive experience coordinating pre-school programs, Family Resource Centers, and other family and education programs in a five county region of central Wisconsin. Curless says that interest in becoming a Promise Neighborhood grew out of the 4Cs Committee (Community Children’s Concerns Committee), a community-based non-profit. “The Committee was formed in 1992 to bring attention and coordinated response to issues affecting children and youth. The Committee read Geoffrey Canada’s book, Whatever It Takes, about the Harlem Children’s Zone and decided to pursue a Promise Neighborhood grant,” Curless says. Renewal Unlimited is an organizational member of 4Cs. Ginny Ann Blackson, Josh Davis, and Lisa Curless at the Rural Education Summit. Photo courtesy of Berea College. The circumstances of the three rural Promise Neighborhoods are in some ways very different from each other. Berea is a college with a long deep history in the region, and Partners for Education has a well-established record working directly with schools. The traditional economies of the three counties include a mix of small farming, coal mining, and light manufacturing. Those economies were never lucrative for most residents and are quickly evaporating. Delta Health Alliance has a network of university partners, significant infrastructure for data management, and grassroots connections to the region. Indianola, in the heart of the Mississippi Delta, has about 12,000 residents. The community supports two distinct school systems. The public system is overwhelmingly attended by African-American students, while the private academy is overwhelmingly attended by white students. The traditional agricultural economy of the region that depended on the denial of quality education to suppress wages has been largely mechanized, leaving behind few work prospects of any kind. Renewal Unlimited is closely tied to the local community and has experience in federal grant administration. Adams County, with a population of about 20,000, retains an agricultural economic base, supplemented with light manufacturing. The leaders of the three rural Promise Neighborhoods have remarkably similar things to say about the work. They point to people—students, families, staff, and communities—as a strength. “The resiliency of people, the number of people who have a sense that things can get better, even without much evidence that they will, are our strength,” says Davis. They also note that combating hopelessness is a challenge. Getting partners collaborating, growing capacity, and seeing things improve for students as a result is gratifying. “This is a systematic analysis of programs, of what is and isn’t working, and what needs to be done instead to get the best educational experience possible for our students,” says Curless.